Delta County, sitting in the heart of western Colorado, boasts iconic natural wonders, towering mountains, deep canyons, and two major rivers. It’s not only a hub for sightseeing but also for outdoor recreation with its year-round mild climate and easy access to hiking trails, mountain and road bike routes, ATV tracks, Gold Medal fishing waters, cliffs for rock climbing, rivers for rafting and kayaking, and historic sites. Whether you enjoy sightseeing, camping, short hikes, or big adventures on rivers and rocks, Delta County offers spectacular scenery for every outing. Here are seven of Delta County’s most amazing places to check out on your next visit. 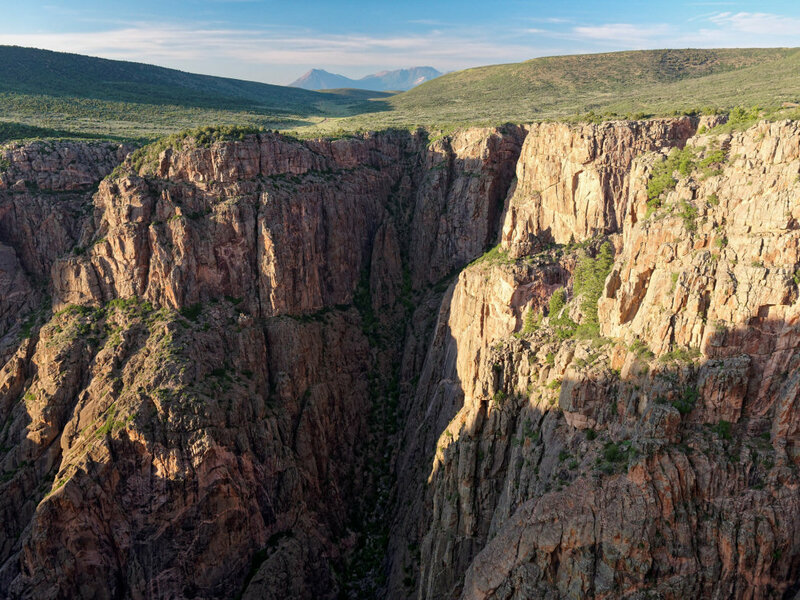 The Black Canyon features 2,500 feet of exposed bedrock, carved over more than three million years by the Gunnison River. Crawford is the gateway to the North Rim of the 30,750-acre Black Canyon of the Gunnison National Park. The sheer gorge, reaching depths of 2,500 feet below the rim, was carved into ancient bedrock by the Gunnison River over the past three million years. The Black Canyon, one of Colorado’s must-see natural wonders, is both beautiful and intimidating. Towering cliffs line the airy chasm, while the roar of the river thunders through boulders far below. The North Rim, with a small campground, climbing access, and hiking trails, boasts the park’s most dramatic overlooks. Check out Chasm View and The Narrows View for the park’s best scenic viewpoints. The Gunnison Gorge National Conservation Area is a playground for fishermen, paddlers, mountain bikers, and hikers. 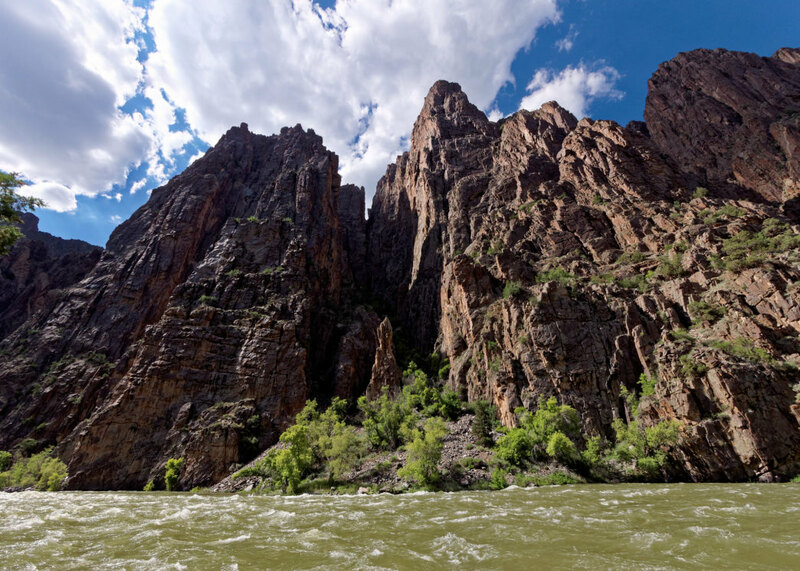 The Gunnison Gorge, a protected 62,844-acre National Conservation Area, includes 14 miles of the rushing Gunnison River below the Black Canyon. The scenic gorge includes an inner canyon lined with sheer cliffs and a broad outer canyon. The Gunnison Gorge forms a wild playground for adventurers, including fishermen who cast for trophy-size trout in the Gold Medal river. Rafters and kayakers paddle down the sparkling river, which is reached by four hiking trails. The area also offers the singletrack Sidewinder Trail, one of Colorado’s best mountain bike rides, horseback riding, camping, and ATV touring on rough roads. Keep watch for diverse wildlife, including mule deer, elk, bighorn sheep, river otters, eagles, and migratory waterfowl. The Adobe Badlands, a Wilderness Study Area northwest of Delta, is a bizarre and austere badlands of clay canyons, sloping mesas, corrugated hills, and Devils Thumb, a jutting landmark pinnacle on the south edge of Petrie Mesa. The scenic area, shaped by water and wind, provides a home for rare plants, the threatened hookless cactus, kit foxes, and white-tailed prairie dogs. The barren Adobes, composed of Mancos shale, offer superb hiking and exploring. One of the best trails begins just north of Devils Thumb Golf Course and climbs 1.1 miles to Devils Thumb and spacious views south to the San Juan Mountains. Escalante Canyon is known for its excellent rock climbing and historic dwellings scattered around the region. Escalante Canyon, lying in the Dominguez-Escalante National Conservation Area, is a deep canyon lined with ruddy sandstone walls that drains northeast to the Gunnison River in western Delta County. The canyon is named for Spanish priest Francisco Escalante who explored the area in 1776 with fellow padre Dominguez while searching for an overland route to California. Escalante Canyon, carved by a perennial creek, is easily reached from U.S 50 by following a gravel road across the Gunnison to the rocky canyon. Escalante Canyon offers a dramatic landscape filled with history and outdoor adventures. 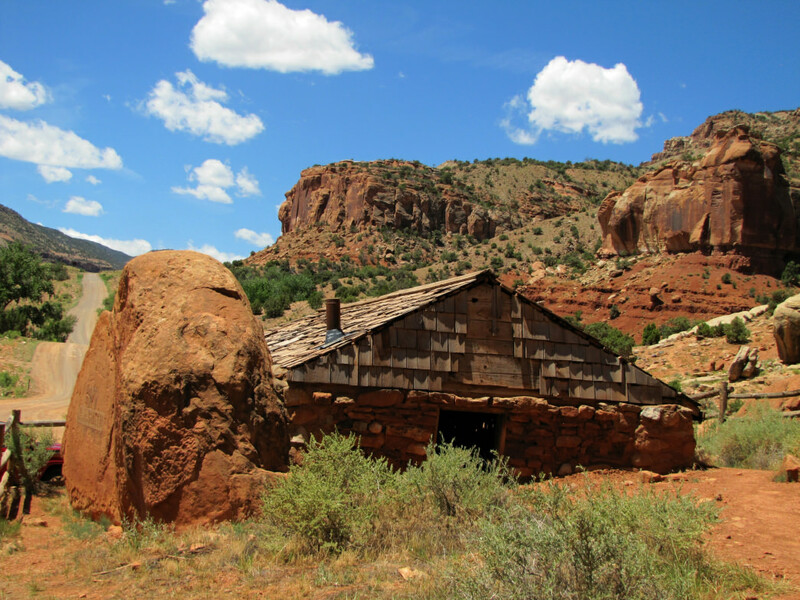 Besides being one of western Colorado’s best climbing areas, Escalante has historic cabins, Native American rock art sites, mountain bike trails, camping, and spectacular scenery. Mount Lamborn, the high point of Delta County, lifts wooded slopes to its pointed 11,402-foot summit, which rises more than 5,500 feet above Paonia in the North Fork Valley. The bulky peak, on the western edge of the West Elk Mountains, is climbed by hiking seven miles up the Lamborn Trail (#894) and Mount Lamborn Trail (#895) from McCluskey State Wildlife Area. The hike passes through diverse woodlands as it ascends Bell Creek to a high saddle. The last section steeply climbs Lamborn’s south ridge to a small, exposed summit with 360-degree views. It’s a place to linger for photos and views of Delta County far below, including the Black Canyon, Grand Mesa, and the distant Uncompahgre Plateau. After soaking up the summit, head down to the Revolution Brewery in Paonia for a celebratory beer brewed from Mount Lamborn spring water. Needle Rock rises more than 800 feet above the Smith Fork River. Rising four miles east of Crawford is the 8,874-foot high Needle Rock, a prominent Delta County landmark and natural wonder. The tall formation, fortified by vertical cliffs, is the hardened plug or throat of an ancient volcano. Needle Rock, towering 800 feet above the Smith Fork River, is best viewed from down the valley with the West Elk Range looming behind. The Needle Rock Trail, starting from the road on the south side, scrambles up brushy slopes for a quarter mile to the backside of the tower and great views. Rock climbers continue ascending on steep, rotten rock up gullies and blocky faces to the rocky summit, which was first reached by 15-year-old Ward Ruble in 1921. Grand Mesa, reputedly the highest flat-topped mountain in the world, spreads across Delta County’s northern horizon. 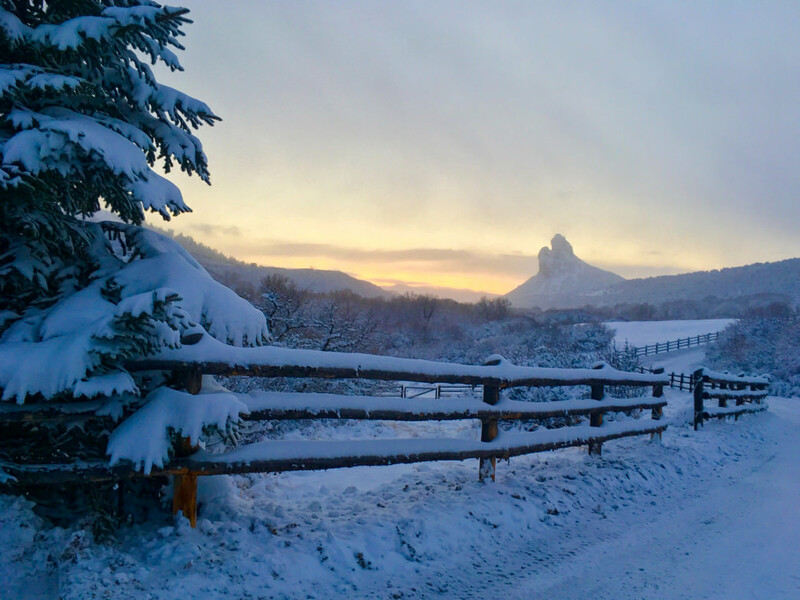 The Mesa, with an average elevation of 10,000 feet, is a world apart from the Gunnison River’s dry valley with evergreen forests, wildflower-carpeted meadows, and more than 300 lakes. This high upland, a summer oasis of cool temperatures and rain, is accessed by 75-mile-long Grand Mesa Scenic Byway from Cedaredge. Head up the highway for spectacular aspen gold in September, excellent trout fishing, miles of trails for hiking and mountain biking, and quiet campsites. At the end of the day, drive out to Land’s End Observatory for spectacular sunset views that stretch west to Utah and south to the rugged San Juan Mountains. Return to Delta by driving 6,000 feet down Land’s End Road, a twisting gravel track, to U.S. 50.